Recently, I was scrolling down my timeline on Facebook and I saw a post in a Notary group regarding a transgender signer, and the comments ran the gamut from supportive to hostile. This post jogged my memory about an experience I had. I received a phone call from an attorney one weekend regarding a client of his who needed mobile Notary services. After discussing the particulars, I accepted the assignment. I then contacted the signer to introduce myself and confirm the appointment. He sounded like a nice gentleman, and everything was arranged easily. Nothing seemed out of the ordinary. I arrived at the client’s home later that afternoon. His daughter answered the door and welcomed me in. She escorted me to the room where her father was. That’s when I got a major surprise. I assumed the signer was a man, but standing before me was a woman. I initially thought that I had made a mistaken assumption based on the voice on the phone call. Tracee Jordan of Houston, Texas, is the NNA’s 2017 Notary of the Year and owner of 24-Hour Notary Houston. Her story is part of the NNA’s periodic series that shares experiences from the Notary community. I introduced myself and asked for the paperwork and photo ID. The woman handed me the document and her ID. Here’s where it gets tricky. The woman’s facial features matched the description on her ID, except the ID said she was a he and included a man’s name. A brief discussion revealed that she had gone through gender reassignment. So I proceeded with the notarization. The signer was able to provide satisfactory evidence of her identity, and then signed the document in both names. I finished, and I went on about my day. Now that literally was a first in my nine years as a Notary Public. I know that being in that environment alone would make many people uncomfortable. Some Notaries would simply refuse to do the job once they arrived. As I thought about what transpired, I reflected that, as Notaries, we are public servants, and it is our duty to seve all the public. We are not the judge and/or jury about the situations we encounter in our day-to-day activities. I actually welcome and appreciate the unique opportunity being a Notary gives me to serve the public. This experience allowed me to open my thinking. How many other transgender signers will I meet? What other variations of the human experience will I encounter? And how I can make all my clients comfortable? What we do may seem routine, but it is so important for people’s lives and livelihoods. In my previous job as a 911 communications operator, I witnessed many dysfunctional and strange situations. I have carried many of the skills I learned as a 911 operator into my Notary business. I am here to serve all people, not judge any individual on whatever they choose to be. I have personal morals and beliefs on the LGBTQ topic, and I keep them to myself. My personal motto is, if it doesn’t affect my pay, it doesn’t affect my day. I can also recall a few years ago, a firefighter here in Texas died on the job, and there was much controversy regarding his widow receiving the life insurance benefits. This firefighter was married to a transgendered person. I do believe that many people mix their personal feelings and beliefs with their professional duties and force their feelings on an individual. In business, that is incorrect. 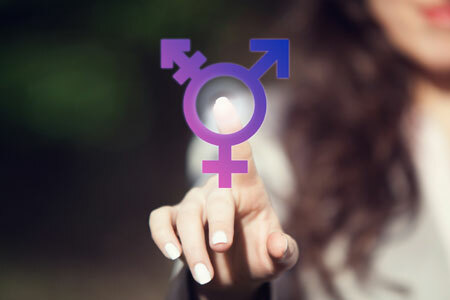 If a transgendered person has documentation to prove their identity, then that person has the right to receive the services that anyone else would recieve. In the Notary world, our responsibility is to to verify the signer’s identity and make sure they are willing to sign and aware of what they are signing. We should not question the content in the document or anyone’s circumstances or choices in life. In this case, I had a document listing a male name aka female name with a Texas driver's license of a male who had the appearance of a female. This presented many issues to resolve, but I took the time to perform checks and balances. Eventually, each and every one of us will encounter a transgendered signer. Whether you are in a major city like me, or in a small town, it will happen sooner or later. Prepare yourself now physically, mentally and emotionally for this. Don’t be offended and don’t offend. Create a game plan for how to verify if the signer has the legal capacity to sign the document as a male or as a female. If you still find yourself stumped, use your resources. Call your Secretary of State. Call the NNA. If you are still unsure, have your signer contact the document recipient for guidance on how to proceed. But don’t assume that you cannot complete the notarization. Happy stamping, everyone. I love this part: "I do believe that many people mix their personal feelings and beliefs with their professional duties and force their feelings on an individual. In business, that is incorrect." I completely agree. While in a position to do public service, we are to serve all people: people like us, people different from us, people we agree with, and people we disagree with. To pick and choose who we serve would be a discredit to our whole purpose. Very well written and from your description, well handled. In today's Inclusive and often explosive society, it is hard to sometimes remember that personal views should have little if any influence on our professional business transactions. This is a very well written and thoughtful reminder of that. Thank you. Well, this article seems more about "advocating" for a group than giving sound advice on how to properly identify the signer, which is something we all really need a clear understanding on. No one is above fraud, and while we want to treat everyone fairly, it is only fair that Notaries need sound procedures in handling such situations so as not to jeopardize our commissions and reputations while being 'sensitive' to the transgender community. I do not want to incur a legal situation and get accused of discrimination simply because of the desire to follow the rules and protect myself. Actually, this happens to me several times a year serving the bay area. If the name on the ID is different from the name I was introduced to but the photo and description match, I say, "the name on your ID is your "legal" or "given" name?" This angle seems to be received well and is more polite than saying, 'your real name?" I agree with the writer. The word “Public “ is in our title. We are commissioned to serve the public. We live in the 21st century. Many of our old assumptions and prejudices have and will be tested. As long as we are satisfied that the signer is who they proved they are it is not up to us to question their sexual orientation. We are there to notarize documents. Anything else is immaterial to our function. I am glad you left your personal condescending attitude at the door. How noble. I'm pretty sure most transgendered folks are used to it. At least you did them the favor of doing your job and doing your best not to judge them. Whether intended or not (I suspect the latter) your article is offensive. As public officials, our job is indeed to serve the public. I'm sure that any transgendered person could give any required documentation proving their identity. What makes this article particularly offensive is that it's presented in the guise of tolerance. What you have done is to treat transgendered people as if they are curiousities and robbed them of basic human respect. Thank you for your comment, Mark. I completely agree with you. "I have personal morals and beliefs on the LGBTQ topic, and I keep them to myself." Um...no you didn't. LBGTQ is now a "topic"? Let's show a little more editorial integrity, NNA. AS A NOTARY PUBLIC WE HAVE A LEGAL OBLIGATION TO INDENTIFY ALL INDIVIDUALS ALWAYS ACCORDING TO THE NAME BASED ON THEIR GOVERNMENT ISSUED IDENTIFICATION, SUCH AS THEIR STATE ISSUED DRIVERS LICENCE, FEDERAL ISSUED SOCIAL SECURITY CARD AND CITY OR COUNTY ISSUED BIRTH CERTIFICATE OR THEIR POST OFFICE ISSUED PASSPORT, WHICH REQUIRES THE INDIVIDUAL TO PROVIDE ALL THE PREVIOUSLY MENTIONED GOVERNMENT ISSUED IDENTIFICATION IN ORDER TO OBTAIN A PASSPORT. ANY OTHER NAME IS ILLEGAL BECAUSE A PHOTO FROM ONE OF EITHER THEIR STATE DRIVERS OR FEDERAL PASSPORT DOES NOT LEGALLY ESTABLISH THAT IT IS THE SAME INDIVIDUAL. THEREFORE, ANY OTHER NAME WOULD BE A VIOLATION OF BOTH STATE AND FEDERAL GOVERNMENT LAWS OF IDENTITY FRAUD. IF THE INDIVIDUAL WANTS TO USE A NEW NAME AKA NAME CHANGE THEY WOULD HAVE TO DO THIS IN A LEGAL MANNER THROUGH AN ATTORNEY OR THEMSELVES BY SUBMITTING AN APPLICATION/PLEADING OF A NAME CHANGE THROUGH THE COURTS SYSTEM. UPON THE COURT GRANTING THE ORDER OF THE NAME CHANGE THEN THEY WOULD HAVE TO GO TO REGISTER THIS DOCUMENT WITH WHEREVER THEIR BIRTH CERTIFICATE IS ON FILE; AND FILE AN APPLICATION WITH THAT GOVERNMENT AGENCY AND ATTACH THE COURT ORDER OF THE NAME CHANGE IN ORDER TO RECEIVE A NEW BIRTH CERTIFICATE WITH THE NEW NAME CHANGE. ALSO, THEY WOULD HAVE TO GO TO THE SOCIAL SECURITY OFFICE AND FILE AN APPLICATION FOR A NAME CHANGE AND ATTACH BOTH THE COURT ORDER OF THE NAME CHANGE AND THE NEW BIRTH CERTIFICATE OF THE NAME CHANGE, SO THAT THE SOCIAL SECURITY ADMINISTRATION CAN ISSUE A NEW SOCIAL SECURITY CARD WITH THE NEW NAME CHANGE. THIS IS THE CORRECT LEGALLY PROCEDURE AND NOT THE METHOD THAT YOU USED BASED ON PHOTO OF A DRIVER LICENSE. THIS IS NOT AN ISSUE OF AN INDIVIDUAL'S CHOICE IN LIFE TO BE A TRANSGENDER, IT IS A LEGAL ISSUE OF COMPLYING WITH BOTH THE STATE AND FEDERAL LAWS. THEREFORE, AS A NOTARY PUBLIC , WE MUST COMPLY WITH ALL GOVERNMENT LAWS, INSTEAD OF COMPLYING WITH AN INDIVIDUAL'S CHOICE BECAUSE ALL NOTARY PUBLIC LICENSES ARE ISSUED BY THE STATE, WHICH WE TOOK OATHS TO UPHOLD BOTH THE STATE AND FEDERAL LAWS. What a great article. I never gave this particular situation much thought but I thought she handled the situation with grace and dignity. We are not to judge but to serve. Maybe I missed something...so did she sign her male name that matched her I.D.? Or did she have a new I.D. in her female name and sign that? The transgender part wouldn't phase me, but the proper I.D. would. quoting Mark Wonk above: I am glad you left your personal condescending attitude at the door. How noble. I'm pretty sure most transgendered folks are used to it. At least you did them the favor of doing your job and doing your best not to judge them. Whether intended or not (I suspect the latter) your article is offensive. As public officials, our job is indeed to serve the public. I'm sure that any transgendered person could give any required documentation proving their identity. What makes this article particularly offensive is that it's presented in the guise of tolerance. What you have done is to treat transgendered people as if they are curiousities and robbed them of basic human respect. I could not agree more with your commentMark. Eloquently said. I am shocked to see that the author off this article was "Notary of the Year" - it strikes me that she could use further training to help her understand the concept of being a public servant. The authors advice to prepare your self "physically, mentally and emotionally" is so incredibly offensive I am shocked that the NNA would use her position to 'educate' the rest of us. Maybe I'm missing something, but this should be a no brainer. If the signer identifies as male, their features match their license description, and their identification matches their preferred name or gender, where was the problem? I can get there would be confusion if the paperwork was naming the individual as his former, female name. It sounds to me like the only problem was the notary perceived the signer as a different gender than they identified with upon first meeting them. I appreciate that this notary did not give the individual a hard time though I do hope that she never referred to them as female as much as she did through this article. As a rule, if someone has transitioned and even gone as far to change their identification, they won't appreciate being referrrd to as the gender they transitioned from. My experience was a bit different. The person that needed documents notarized had no ID. He was preparing for his transgender surgery and used a female name and wanted the documents to reflect the name he used. I just had him bring 2 reliable witnesses who could verify who he was and treated it like any other notary for a client with no ID. Thank you for the article it was very helpful. The use of the word "transgendered" is incorrect. The correct term is transgender. GRIFFIN, There is no need to Shout "CAPS". Just remember that you have a Driving "License" and a Notary "COMMISSION" know the difference.